Heartworm is a serious, life-threatening disease of dogs. It is due to the presence of the adult stage of the parasite, Dirofilaria immitis, in the pulmonary arteries and right ventricle of the heart. Until the early 1970s, the occurrence of heartworm in the United States was primarily confined to the southeastern part of the country. Today, it is found almost everywhere in the continental United States and is a major threat to the dog population of Canada. Since heartworm is most commonly seen in dogs, this article is focusing primarily on canine heartworm. However, most of this information is also true for the other species that contract heartworm. Transmission of heartworm depends upon the mosquito population of an area. About 70 species of mosquitoes are capable of transmitting the disease. The more mosquitoes in an area, the greater the chance of heartworm transmission. Heartworm disease occurs most commonly in dogs. It has recently been shown that heartworm is a major cause of heart disease in cats. Heartworm also infects wild animals. Coyotes, wolves and foxes are carriers of the disease in the wild. In a particular area, when the wild animals are infected, the disease is permanent. The adult heartworm is 6-14 inches in length. It is thread-like, white in color, and primarily found in the pulmonary arteries and right ventricle of the heart. When adult male and female heartworms are present, mating occurs. The female releases large amounts of small, microscopic "microfilariae" into the bloodstream. The circulating microfilariae can live up to two years in the dog's bloodstream. Several microfilariae are ingested by a mosquito when it bites a dog. The mosquito serves as an intermediate host as well as vector (the transmitting agent) for the disease. The mosquito spreads the disease to another dog by injecting the microfilariae at the time of the bite. In order for the microfilariae to become infectious, they must develop inside the body of the mosquito. This development occurs only under certain environmental conditions. Two weeks of temperature at or above 70 degrees F is required. As a result of this temperature requirement, transmission of the disease is limited to the warm months. After the microfilariae have gone through their development, they are ready to infect a new victim. During a blood meal (mosquito bite), the mosquito injects the microfilariae into a new dog. These small, microscopic worms migrate under the skin and eventually enter the dog's blood stream. About 6 months after the initial mosquito bite, the microfilariae arrive at the heart. 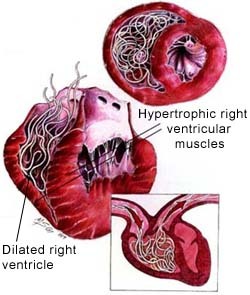 The final maturation and the mating of the heartworm occur in the pulmonary arteries. The adult worms live in the pulmonary arteries and right side of the heart, where they can survive for seven years. 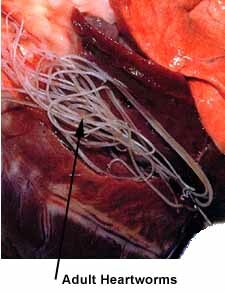 Adult heartworms cause inflammation and thickening of pulmonary arteries. As time passes, more arteries become inflamed and clots begin to appear. The blocked pulmonary vessels lead to an increase in blood pressure. This increase in pressure places a strain on the right ventricle of the heart. Eventually, heart failure occurs. Clinical symptoms of heartworm disease develop very slowly. Often, symptoms are not noticeable until 3 years after the initial infection. Most of the symptoms are due to problems associated with increased work load for the heart. Lack of energy and exercise intolerance are early symptoms. Chronic coughing and difficulty breathing are both common symptoms associated with heartworm disease. As the disease progresses, most dogs develop congestive heart failure and ascites. Dogs often collapse in the final stage of the disease. Not only is heartworm dangerous, but the treatment for heartworm disease is dangerous as well. When it comes to preventing heartworm disease, pet owners have a number of options. Before beginning preventive medication, pet owners should have their pets tested for the presence of heartworms. If heartworms are present, a treatment plan should be discussed with your veterinarian. Most heartworm prevention is done by administering your pet a once-a-month heartworm preventive medication. Many of these monthly products are administered as a chewable treat. Some are combined with other preventive medications. Your veterinarian will recommend the product that is best suited for your pet. If you would like to have your pet tested for heartworm or you would like additional information about the disease, please call the hospital.